With the $5 million purchase of the remaining piece of land needed for an assemblage, developer Michael Comras can move forward the development of 4-story retail project viewed as “the gateway to Miami Beach,” per The Real Deal. According to property records, Comras’ MAC 1045 5th St. LLC picked up the 7,000-square-foot site at 1031 Fifth St. from Carefree Lifestyle, a luxury concierge service led by CEO Gary Marotta. He received the city approvals needed to move forward with the development in late 2016. Comras has plans to develop the 82,000-square-foot BLVD at Lenox, which will be located on six lots that make up two commercial parcels at 1045 Fifth St., 1031 Fifth St., 527 Lenox Ave., and 543 Lenox Ave. Comras reportedly paid $3.48 million for the properties at 1045 Fifth St., 527 Lenox Ave., and 543 Lenox Ave. in 2014. The two combined parcels contain two buildings, a one-story car rental agency, and a two-story nightclub that Comras intends to tear down. He acquired the nightclub parcel two years ago and has an option to acquire the other property, he told The Real Deal. City officials say the area of the development is one of the most heavily traveled commercial corridors in Miami Beach but doesn’t have as much pedestrian traffic as nearby Alton Road or Washington Avenue. The complex, being designed by Zyscovich Architects’ Suria Yaffar will have three floors of retail space, along with parking on the third, fourth, and rooftop levels. 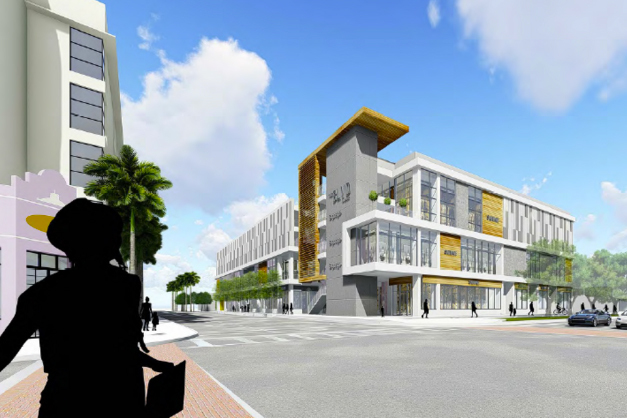 When it’s done, it will be one of the largest LEED-certified buildings in Miami Beach. The project is a block away from Fifth and Alton, a retail complex anchored by Best Buy, Publix, and Total Wine & More.